Happy Monday, my friends. The theme this week for the Joy's Life design team is Halloween bags. 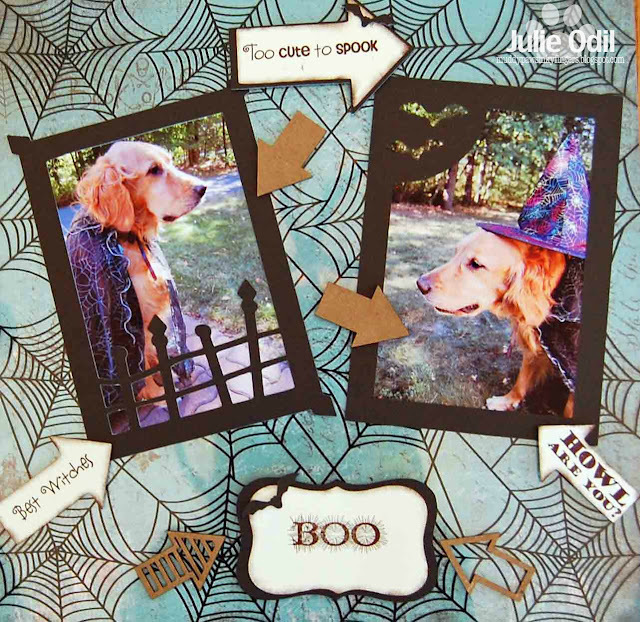 I found an adorable one at My Scrap Chick that I decided worked wonderfully with the adorable Joy's Life Halloween Puns stamp set. Scary, isn't it, LOL? I thought this was the sweetest ghost I'd ever seen with those rosy cheeks and top knot. The Halloween Puns stamp set and all of the Joy's Life sets can be found in the Joy's Life store﻿. Don't forget to check out the Joy's Life design team projects all week to see more Halloween bag inspiration. This card is a modified tri-shutter card. 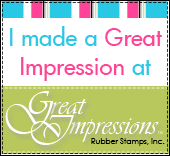 I found the tutorial HERE on Splitcoast Stampers. 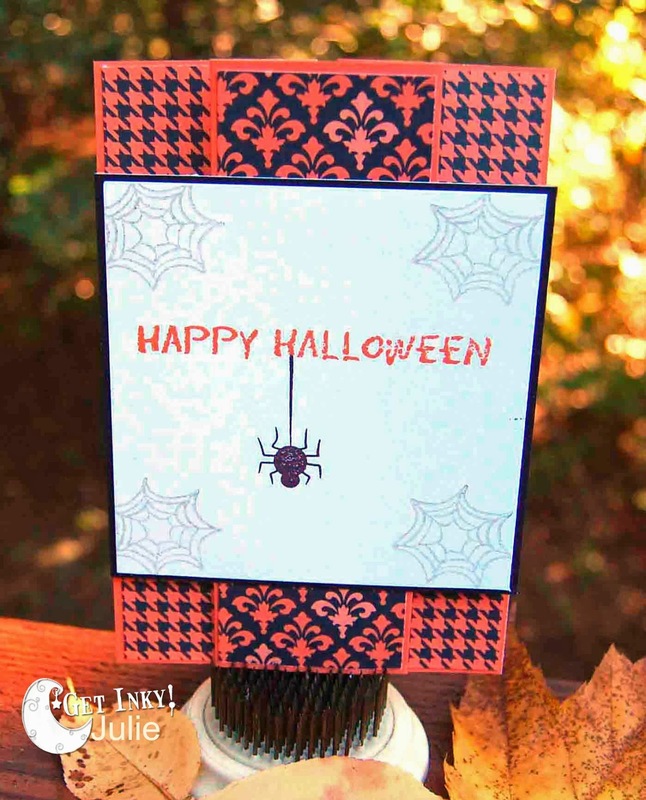 This was all stamped using the Halloween 2013 stamp set from Get Inky! Stamps. This card was easy to make and very fun! The challenge runs for 2 weeks, so get out those Fall colors, get creative, and link up with us at Get Inky! Challenges! It's Friday, It's Fall, and it's Friends with Flair! I keep thinking, one of these weeks I'll miss linking up to FWF, but here it is, the end of September, and I'm still keeping my New Year's resolution of linking up every Friday. We'll see if I can make it all year. It's getting tougher and tougher! Anyone else got a long FWF streak going? 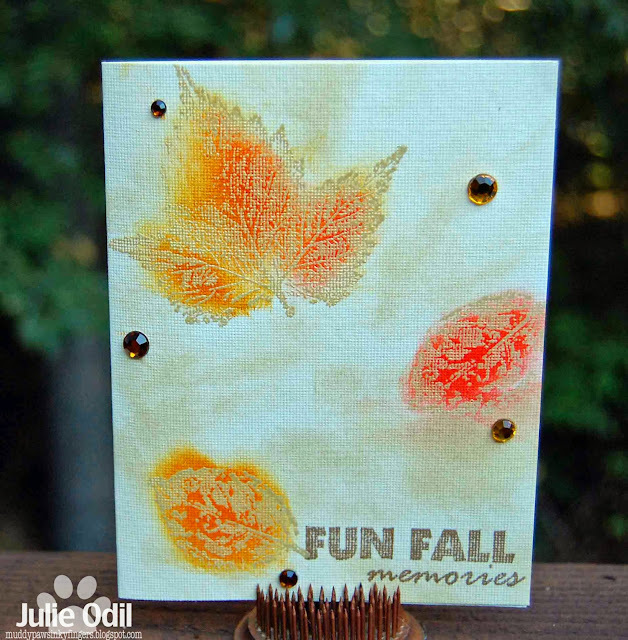 I used two different Unity sets on this card: Susan Weckesser's "Autumn Grunge" (LOVE these leaves!) and "Grateful Hearts". I used a piece of Bazzill textured cream colored cardstock for the base. I embossed the leaves using Ranger gold embossing powder. Then, I used various distress inks throughout the card. The sentiment was stamped with Close To My Heart desert sand ink. The bling is from my stash. I mailed out the card to my BFF, thanking her for having me for dinner last week when I was at conference, and letting me play with her Golden Retriever puppy! So fun! Hope you have a chance this weekend to create some of your own "Fun Fall memories." Here we are in the first few days of Fall, and it feels like it here in NW Wisconsin. Our nights are getting chilly, the sun doesn't have much warmth, and the leaves are turning and falling. Such a pretty time of year! Since I used the fall word shaped card in a post yesterday, I went with the acorn shaped card today. 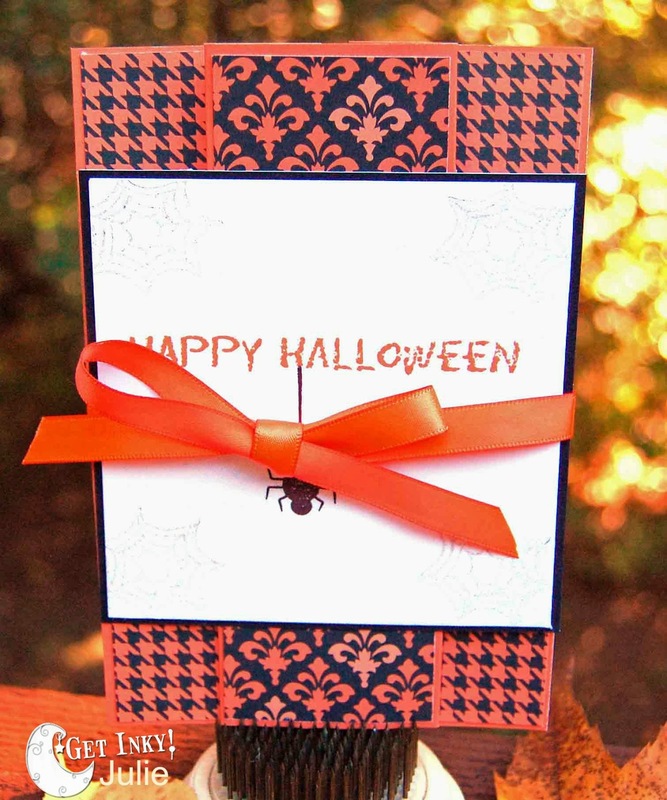 It's definitely a fall-looking card, don't you think? I loved how this turned out. I've been excited ever since I got it made to post it today! The fall looking paper on the base is from Little Yellow Bicycle -- Acorn Hollow 12x12 paper. All other papers are Close To My Heart cardstock. 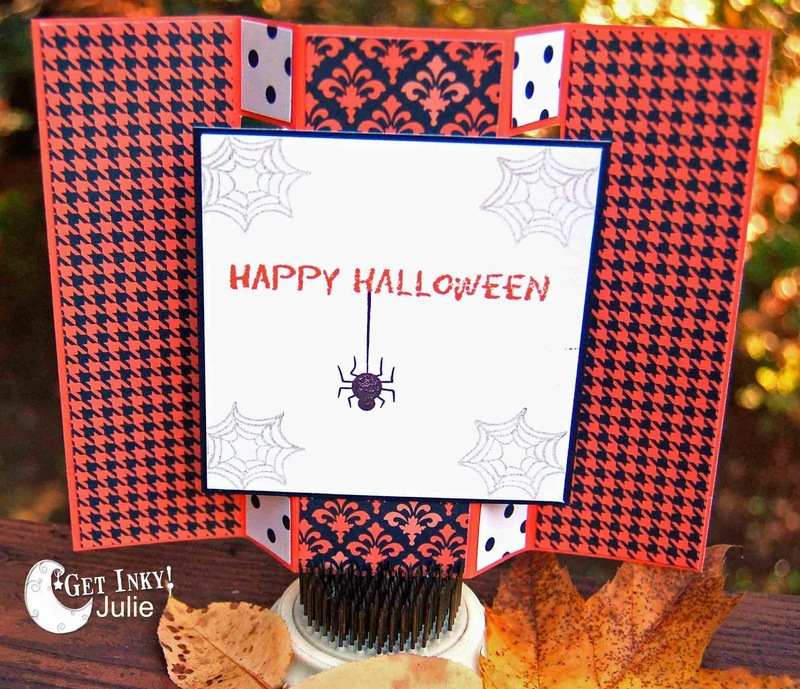 I used a Spellbinder die for the ribbon slide, and the Joy's Life stamp set, "It's All Fall Puns" found in the Joy's Life store. 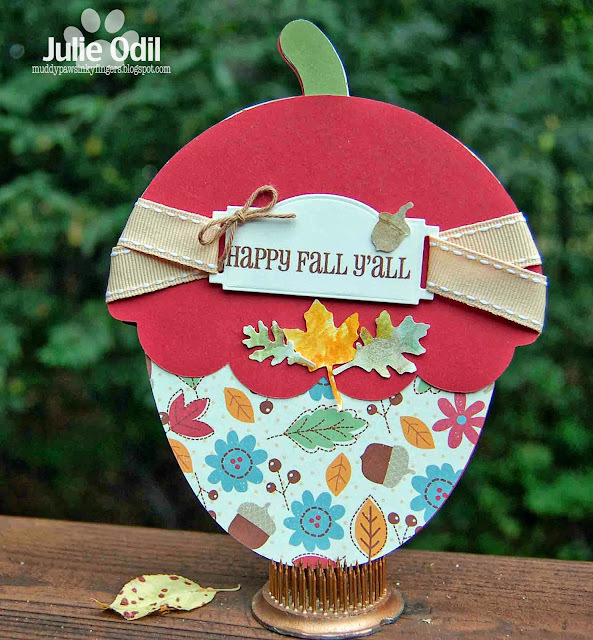 The fall leaves and acorns are a Tim Holtz die that I painted with various Creative Inspirations paints. The twine and buttercup ribbon are also from Close To My Heart. It's hard to tell the size of this card without any perspective, but it's big! There's plenty of room to write a great big, long message inside. My BFF is gonna love this one! Don't forget to visit The Cutting Cafe's blog every Thursday for a chance to win 3 sets of your choice from The Cutting Café online store. 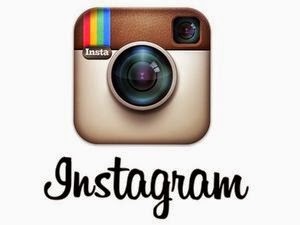 All you have to do is comment on the post to be eligible to win. Easy peasy! Buttons, Burlap, Kraft, or Twine -- for Joy's Life. And a winner! Happy Monday, crafty friends. It's all about using texture for a Fall-like feel this week with the Joy's Life design team. Since yesterday was the first full day of Fall, we're right on track with these projects! 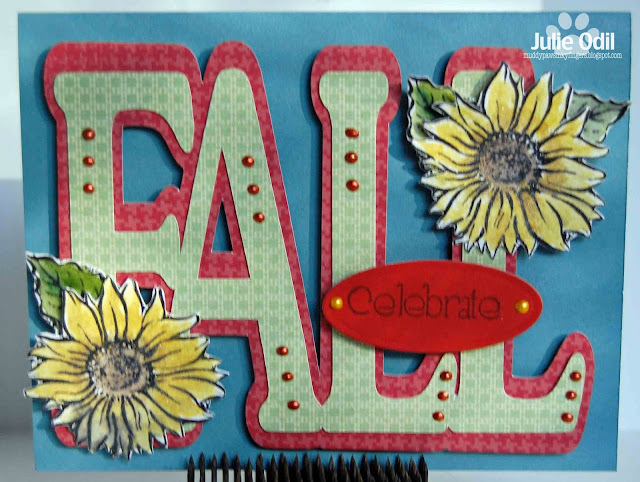 The sentiment is from Joy's Life "It's All Fall" stamp set. You can find this set, and all her wonderful stamps, here in her store. I used a cutting file from The Cutting Café for the "F-A-L-L" and the outline. The fall leaves are a Tim Holtz die, painted with Creative Inspirations paint. The papers used for the lettering are 12x12 Acorn Hollow by Little Yellow bicycle, mounted on a Kraft cardstock base (Close To My Heart). 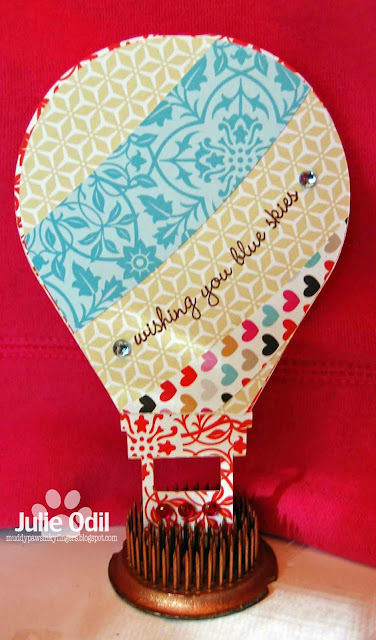 The tag shape is cut with a Spellbinders die, and the twine is from Close To My Heart. 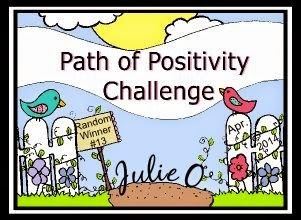 I promised to pick the winner of my blog candy and announce it today with my Joy's Life post. I used Random.org to help me with the selection. I entered my total # of comments from the hop, and Random.org picked comment #11. Chriss America Real! You are the winner! 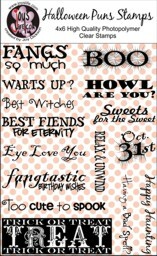 Halloween stamps, Halloween rub-ons, ribbons, embellishments, it's all heading your way, as soon as I get your address. We barely hit 50 degrees here in WI today, with a cold North wind. 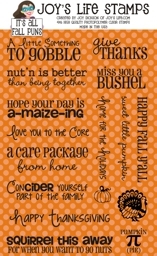 Yes, Happy Fall, Y'all!! 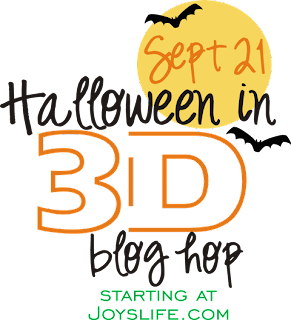 Halloween in 3D Blog Hop with Joy's Life! Aren't these fun? The sentiments are from Joy's Life Halloween Puns stamp set. You can find this set, and all of Joy's wonderful stamps HERE in her store. This coffin box cutting file is from the Silhouette online store, and can be found HERE. The boxes were cut out on my Silhouette Cameo. I cut them out with black Close To My Heart cardstock, then heavily inked the edges with CTMH White Daisy pigment ink. 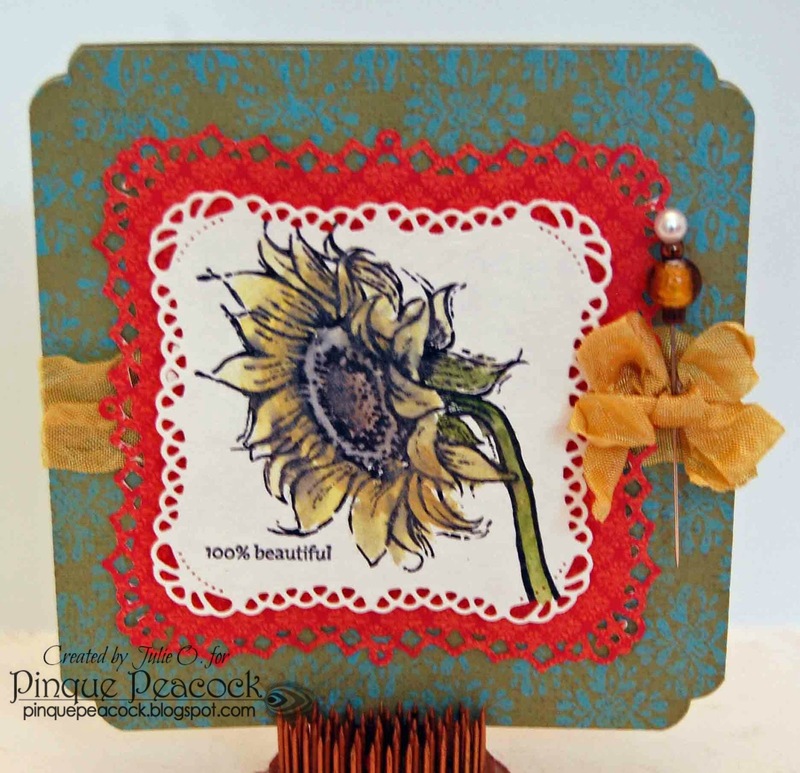 The sentiments were stamped on CTMH Gypsy colored cardstock. The banner shape was created using the Designer Edition software, and adjusting a banner shape to fit inside the coffin box. The bats, also cut out on the Silhouette, were left over from a project earlier in the week, and fit perfectly. Lucky me! I used some Totally White twine from Trendy Twine. Halloween is all about the candy, so how about some blog candy? 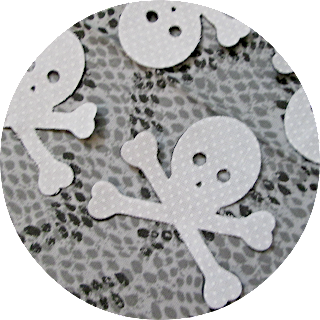 I have some Halloween stamps, ribbon, Halloween rub-ons, and embellishments to give away. To be eligible to win, please follow my blog and leave a comment on this post. I will choose the winner and announce it with my Joy's Life post on Monday, Sept. 23. It's time to go see what Kendra has for you today. Knowing Kendra, it's got to be fantastic! Have fun, but don't get spooked! Every girl needs shoes for the party! It's Thursday, crafty friends, and we're already more than 1/2 way through September. How did that happen? 3 Girl JAM is celebrating all month long! It's the 2 year anniversary of this wonderful company. There have been many giveaways and even a sale or two. It's been a great month so far, and there's more to come! Well, today, I have a high-heel shoe card to match! Wouldn't they rock any party outfit! I used 3 Girl JAM tuxedo ribbon from the Celebrations bundle. The high heel shoe is a cutting file from The Cutting Café, one of the many great sponsors this month of prizes for 3 Girl JAM. Papers for both the purse and the shoe card are from the DCWV, The Black Currant Stack. All the bling is from Close To My Heart. When I enlarged this picture, I see there is a dog hair on the shoe. That is courtesy of either Sammy or Sophie! 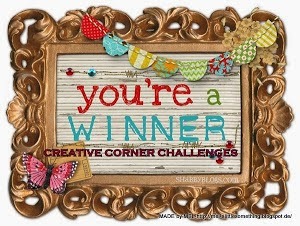 I LOVE the New Challenge at Cameo Creations! 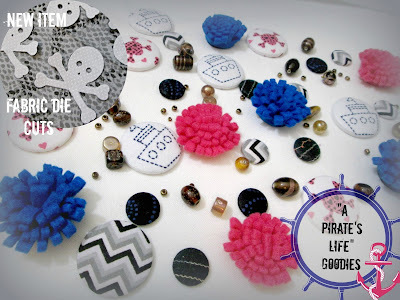 There's a new challenge starting today at the Cameo Creations Challenge blog, and it's one I really enjoy. The challenge is to use patterned papers. I love to use a variety of different patterned papers, so this one was really fun for me! 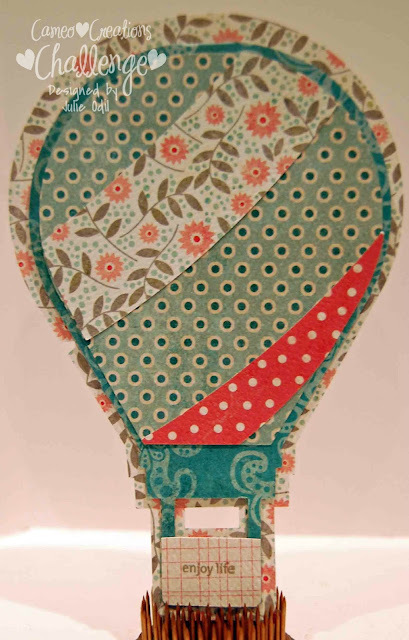 This hot air balloon shaped card is a cut file from The Cutting Café. I cut it out on my Silhouette Cameo, of course! All the patterned papers are from My Mind's Eye -- the Stella & Rose collection. The sentiment is a Close To My Heart stamp set. I hope you enjoy this pattern-filled project. Make one of your own, and join us at Cameo Creations Challenges! You have two weeks. 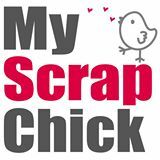 Scraptastical Kreations is furnishing the prize -- a $20 gift certificate! Welcome Friends With Flair! I'm editing this post to include all of you! 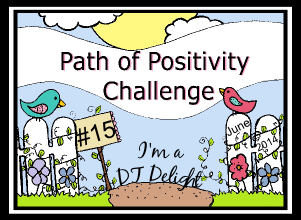 I've been out of town for several days and won't get home until late this evening, so no time for new creations, but this post has some Unity in it, so I'm linking it up. I wanted all of my FWF peeps that like SVG files to know about The Cutting Café. If you comment on The Cutting Cafe's Blog post each Thursday, Regina generously gives away any three sets from her store. I won several times before I made the design team and it's a great way to add to your SVG collection. Happy Wednesday everyone! I'm heading across the state for a work related conference today. I'll be there for the next 3 days. The good news? I get to spend tomorrow evening with my BFF and her Golden Retriever puppy. Yeah! This week at The Cutting Café, we're bringing out the masculine projects. 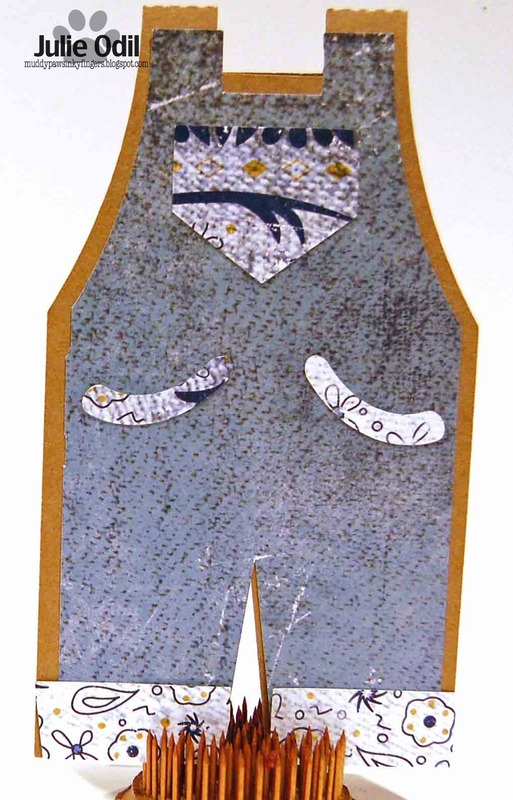 And what could be more manly than a pair of bib overalls? 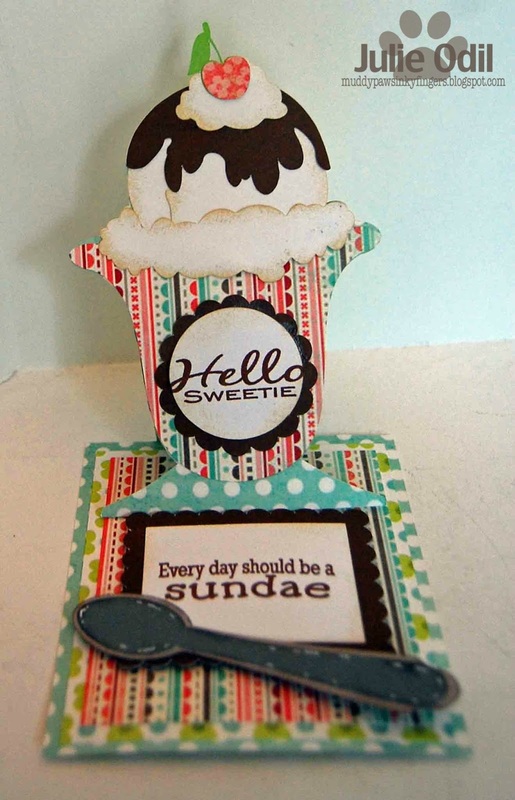 I chose to work with this Overalls Shaped Card file from the Cutting Café Store, and cut it out on my Silhouette Cameo. What do you think? Are they "all boy"? Authentique Papers have some great denim patterns, and that's what I used on this card. 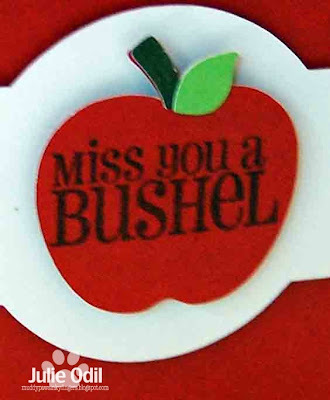 There's also red cardstock from Close To My Heart. 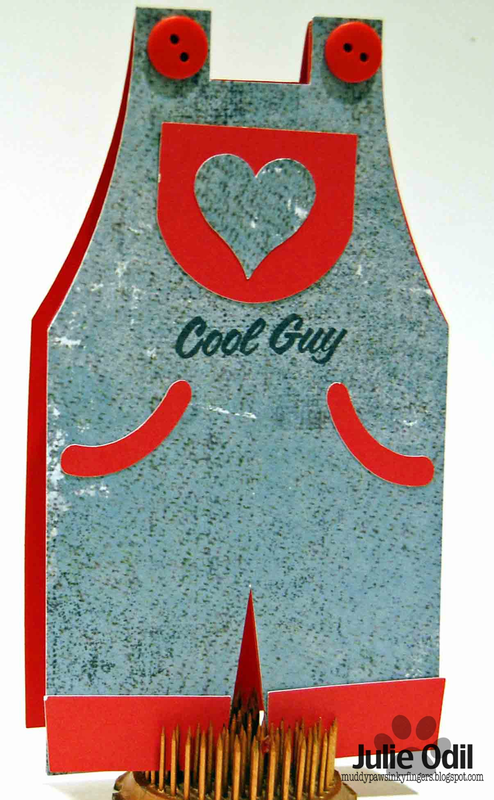 The "Cool Guy" sentiment is CTMH as are the buttons. As I was working on the first card, I was trying various things, and ended up with some leftover pieces. I decided to assemble another card, just for fun. This one has a decidedly more "girlie feel" -- at least on the outside. But wait. There's a surprise. Snicker, snicker. Again, the designer papers are from Authentique, on a Kraft base. This one has a sentiment inside, from Unity stamp company. Bwahahaha! You weren't expecting that were you? Enjoy your day, everyone! Happy Tuesday, crafty friends. Joy's Life is having an "It's All Fall" project parade on her blog today. I knew right away I wanted to do something besides a card, so I started thinking "outside the box". All the projects featured today on the Joy's Life It's All Fall project parade use the "It's All Fall Puns" stamp set, found in the Joy's Life store. I used Close To My Heart cardstock and ink throughout this project. The box is a cut file from the Silhouette online store found HERE. The ribbons are all from Really Reasonable Ribbons. Make sure to check out Joy's Life blog for the rest of the great projects showcased by the Joy's Life design team today! I know it's only September, but I've been working on some Halloween things already. I wish I could get going on Christmas! Maybe soon, LOL! 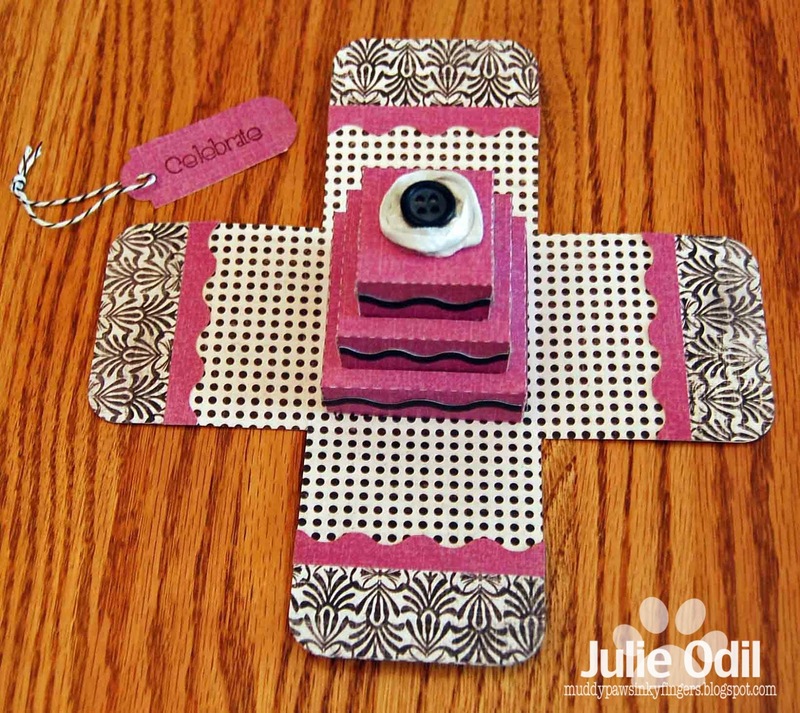 This week, the Joy's Life design team is sharing scrapbooking ideas. It's been a few months since I've found time to make a layout, so I enjoyed this assignment very much! Golden Retrievers are wonderfully docile dogs, and my Sophie is no exception. I dressed her up until she felt silly and went on a Halloween photo shoot for this layout. What do you think? Is she too cute to spook? Joy's Life "Halloween Puns" stamp set was used throughout this layout. 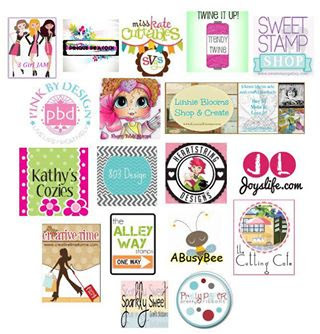 You can find it, and all Joy's wonderful stamps in her STORE. I used Fancy Pants Halloween papers on the layout, and a Fancy Pants acrylic spider web overlay. The Close To My Heart Artbooking cartridge was used to cut the picture frames and bats. The arrows and fancy rectangle shape are from the Close To My Heart Art Philosophy cartridge. 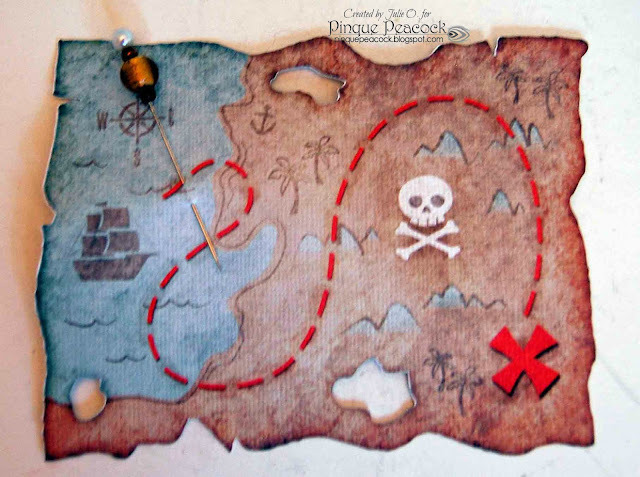 I also used some chipboard arrows from Umwow Studio on this layout. I hope you enjoyed my Silly Sophie and her Spooky Halloween outfit. She's ready for the holiday. Are you? There's a new challenge starting today at the Get Inky! Challenge blog. It's based on a song title. I think I must be getting old, because I've never heard of the song, but it has something to do with birds and bees. So, I went with a bee theme for my project for the challenge. And, since it's a challenge, I wanted to try something I'd never done before. I used the really, really big, really loaded with tons of great images and sentiments Get Inky! set called "Buzzing Bees". It is an 8"x12" stamp set. Big! These are only a couple of the many bee images on the set. And one of the many many sentiments included. I fussy cut the heart (also a stamp in the set) and used foam tape to elevate it. All the papers, the ink, and the foam heart are from Close To My Heart. The rocker card is a file found in the Silhouette Store. You can find it HERE. And, finally, we will get to my project for the pirate-themed hop! 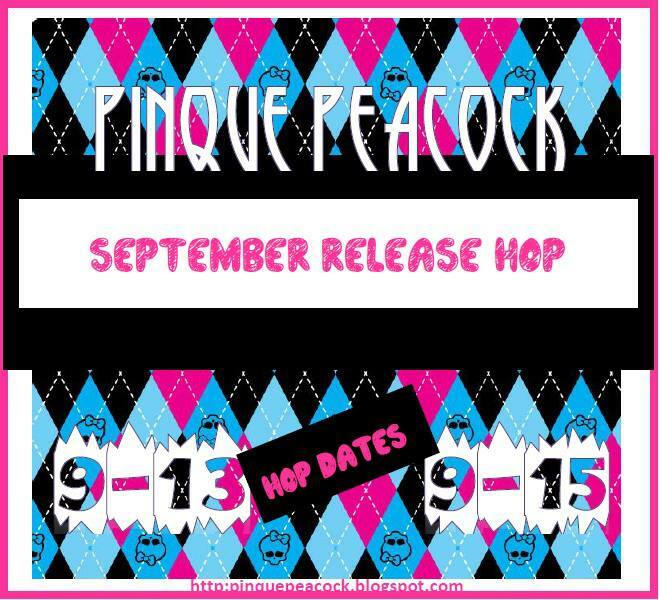 This is my first hop with the Pinquettes, and I'm super excited to share my projects with you. Oh, wow, hey. That's impressive. A pirate map with a gorgeous Pinque Peacock beaded stick pin. 'X' marks the spot. Hmm. Well. OK. I knew I needed to re-think things and come up with something a little more impressive than THAT. I mean, really. First hop, and that's the best I could do? 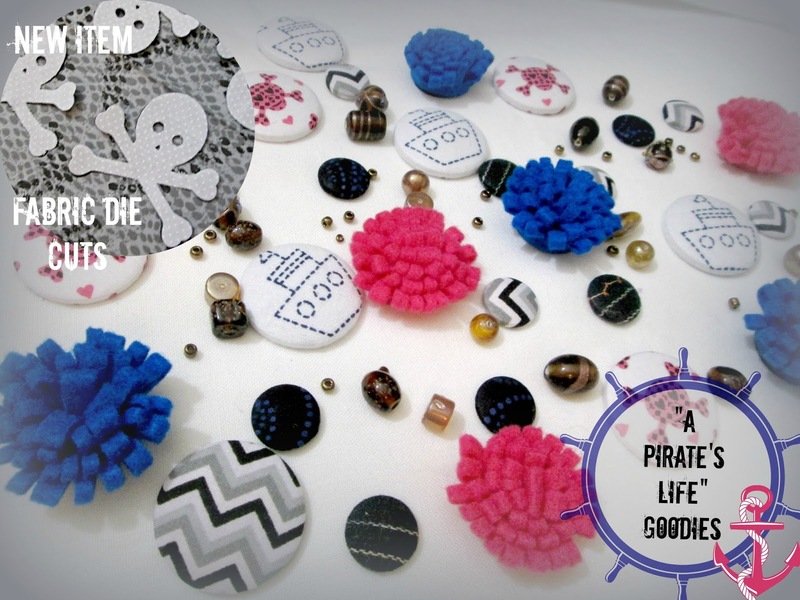 So, I started thinking pirates, and booty, and pretty baubles. Then, I remembered there were women pirates. And then, I HAD it! 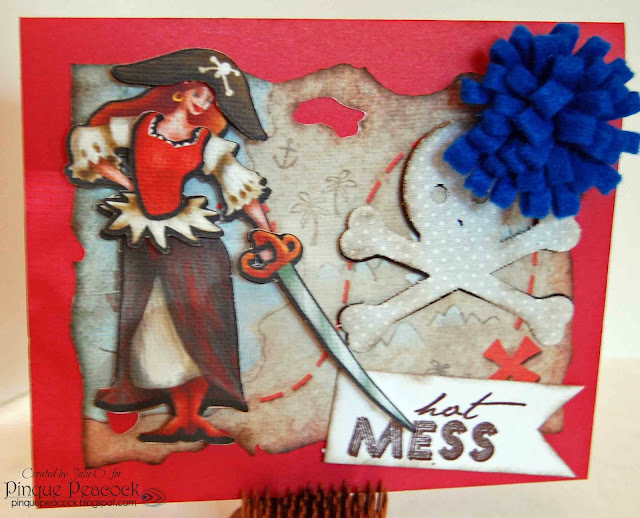 I created this card using my Cricut Imagine machine and the Buccaneer cartridge. There's a beautiful blue felt popper to highlight this card, and the newest addition to the Pinque Peacock line, the fabric die cut skull shape. The female pirate is paper pieced. Some parts are elevated with 3D foam tape to give her some dimension. The sentiment is from one of my favorite stamp companies, Unity. The stamp set is called "Sassy Pants", designed by Erin Schreiner for Unity. 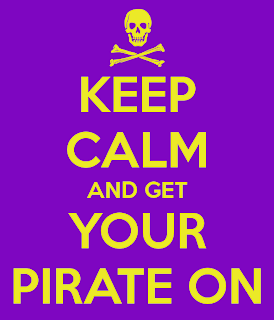 I thought it worked perfectly for this steamy little pirate! Happy Friday, everyone! I hope you've had an enjoyable week. We've been working short-staffed at work. No, I've been working short-staffed, so I'm very glad for the weekend. I hope to catch up on some rest and some crafting this weekend. The "Fall" word shape is a cutting file from The Cutting Café, found HERE. It comes with a word shaped card also. I cut the word shape out on my Silhouette. The sunflower stamp is a retired one from Close To My Heart. I used Creative Inspirations Paints in Mellow Yellow, Sunshine, and Mocha Latte on the flowers, and Evergreen, and Emerald on the leaves. The "Celebrate" sentiment is from the Unity set I use the most, "Happy Everything". Papers are by Little Yellow Bicycle, Acorn Hollow (both 12x12 and 6x6 papers). I used two different colors of Viva Décor Pearl Pens on this card -- Sunny Yellow and Copper. I hope you enjoyed my Fall inspiration. Do you like pirates? Looking for some inspiration for the upcoming Halloween season? 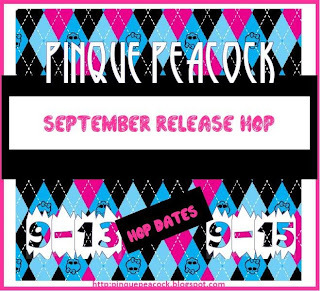 I'm hopping tomorrow with the Pinque Peacock Artists and Creators and I'd love it if you'd stop in for a visit. I'm showcasing Unity stamps again. And, there's prizes to be won! It's Hump Day, everyone! Can't you just see that camel swinging down the aisle, saying, "Mike, Mike, Mike?" I don't watch much TV, but I laugh every time I see or hear that commercial. I have another shaped card on the Joy's Life design team blog today. I love shaped cards! Today's is a cut file from The Cutting Café. I used the Joy's Life stamp set, "Pun in the Sun". I just love this set! I think I've used it more than any other Joy's Life set I have, and they've all seen a lot of ink! The cutting file from The Cutting Café can be found HERE. The papers are from Fancy Pants 12x12 Love Story collection. The bling is from my stash. I am "wishing you blue skies." Sunflowers Make Me Happy on Tuesday, Too! Happy Tuesday, my loyal blog followers! I'm filling in today on the 3 Girl JAM blog. Since yesterday's post that I had on the Pinque Peacock blog works so well for the 3 Girl JAM blog, I'm posting it again. It might look familiar! Besides, I really DO love sunflowers! And 3 Girl JAM ribbon! And Pinque Peacock beaded stick pins! The ribbon is from the Royal collection. I placed two layers of the Gold Crown crinkle ribbon on the center of the card, tied it with a double bow, and placed a Pinque Peacock beaded stick pin in the bow. This week, the Cutting Café design team is making projects using school themed cutting files and printable stamps. I have to admit, this one was a bit more of a challenge for me than last week. Sometimes I get an idea, and it doesn't quite turn out in real life like it looks in my head. Ever have that happen? This was one of those projects. The pencil box is BIG! And TALL! It holds 18 pencils. The papers are by Piggy Tales. The ribbon is from Close To My Heart. I printed the sentiment, then used a Spellbinders ribbon slide die. Here's a different angle where you can see the box shape a little better. I colored the School Borders Printable Set with watercolor pencils. I'm using this pencil box to send some watercolor pencils to a crafty friend. I hope she likes it! Happy Monday, blog friends. Or should I say Sundae. 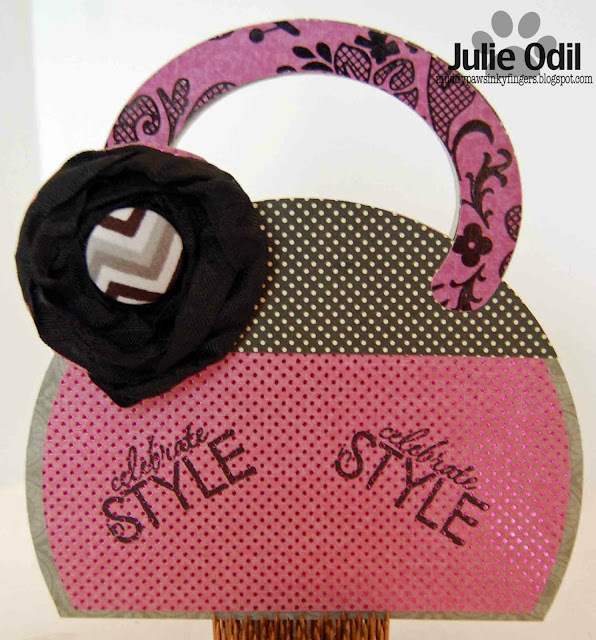 This week, the Joy's Life design team is featuring shaped cards. Now, this is MY kind of theme! I LOVE shaped cards! I will have two of them on the Joy's Life design team blog this week: today and again on Wednesday. Yes! 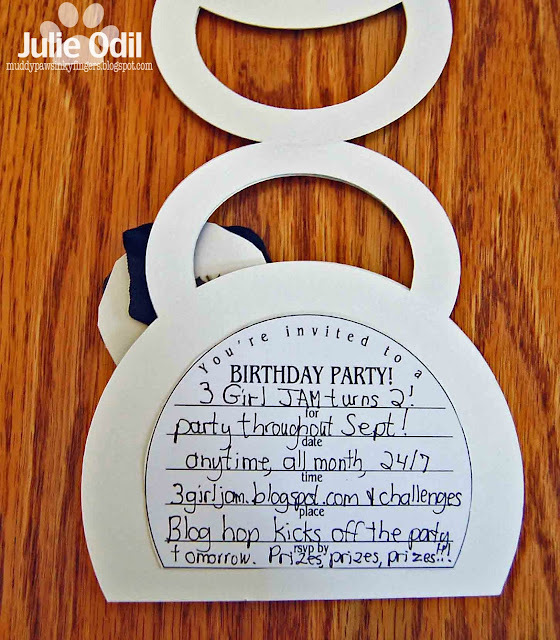 There are lots of wonderful shaped cards out there, and I found a very fun easel card at My Scrap Chick.﻿ I purchased it earlier this summer and have been waiting for a chance to use it. Today was my chance! I thought it paired up perfectly with the Joy's Life stamp set, "Yummy Puns". I used two of the puns on this card. Isn't it fun? The designer papers are My Mind's Eye Lime Twist. I wanted something really bright and cheerful, and full of patterns. I used Close To My Heart cardstock for all the solid color pieces. The card was cut out using my Silhouette. A white gel pen added some highlights to the spoon. Makes you hungry, doesn't it? Come back Wednesday for another shaped card for Joy's Life! Sunflowers Make Me Smile -- plus W-I-N-N-E-R-S-! Happy Monday, blog friends! I'm filling in today on the Pinque Peacock blog. I thought I might as well do something I love, and got out my Creative Inspirations Paints yesterday to do some water coloring. I love it when I can get ink and paint on my fingers all with the same project! Creative Inspirations Paints is having a design team call. Yes! I've been stalking their blog, bugging their DT for info, waiting for this to happen! Happy dance! 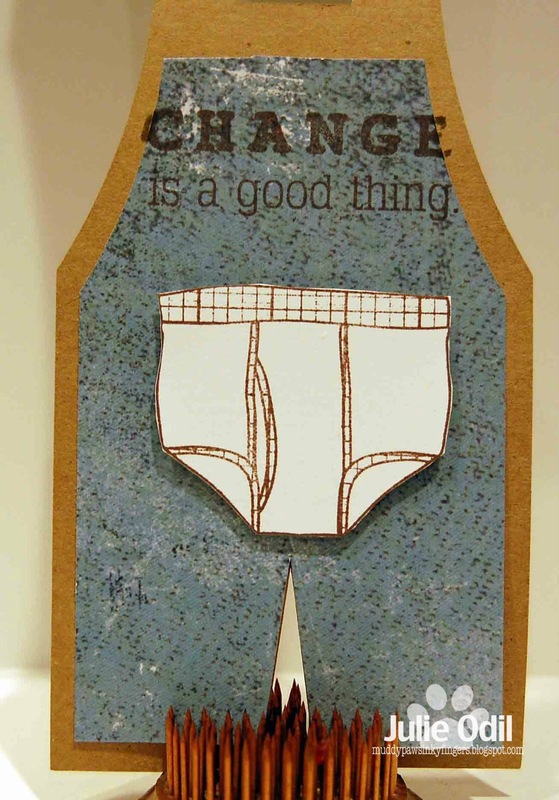 So, this card will be submitted for the call. Sunflowers are blooming right now here in NW Wisconsin, so they inspired me to paint this card. The sunflower is a Close To My Heart stamp, as is the sentiment. I used 3 colors of Creative Inspirations Paints on the flower (Mocha Latte, Sunshine, and Mellow Yellow) and 2 on the leaves (Emerald & Evergreen). I used a Spellbinders die in 2 sizes, and the designer papers are retired papers from Close To My Heart called Stella. There's some scrumptious 3 Girl JAM ribbon tied around the card. And, of course, a FAB Pinque Peacock beaded stick pin. Oh MY! Winning the School Days Flair buttons, generously donated by 3 Girl JAM -- Diana Larson! 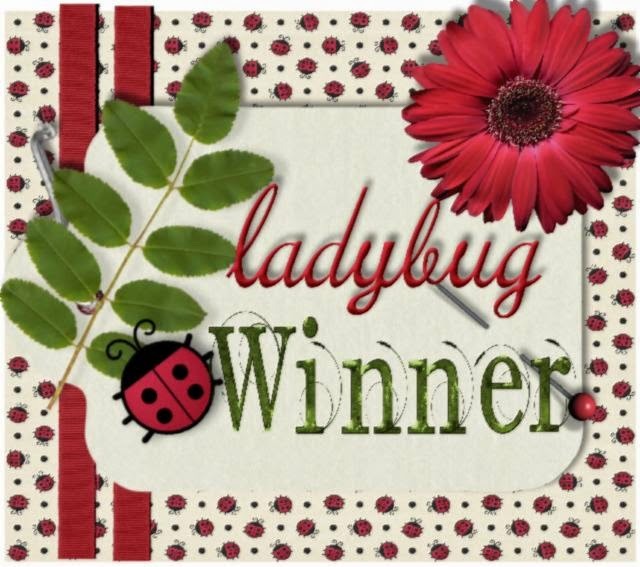 Winning the blog candy from my blog -- Beckie Creative Crazy. I'll be in touch with both of you to get your winnings to you. Stop and smell the sunflowers! I loaded the shape into the studio software, offset it, duplicated it in a mirror image, then welded the tails together. I used Echo Park card stock on the card. I was so pleased with myself! Then, I went back and read the challenge again. "welding letters". Geesh. I sure do make a lot of work for myself sometimes! So, I found a font I liked, typed 'woof', offset it, welded the offset letters together to make the word bubble, then cut the original letters out individually. There. Done! 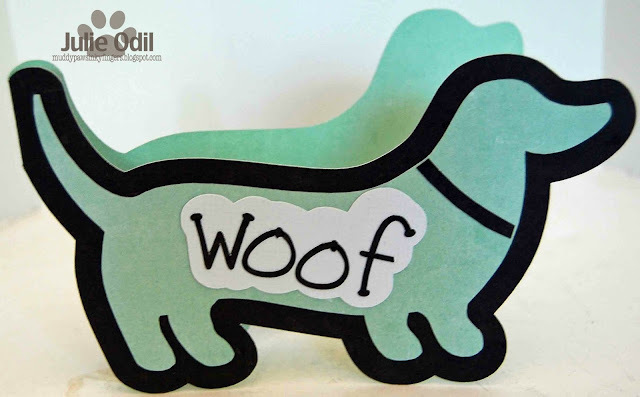 And a pretty dog-gone cute dog shaped card, if I do say so myself. 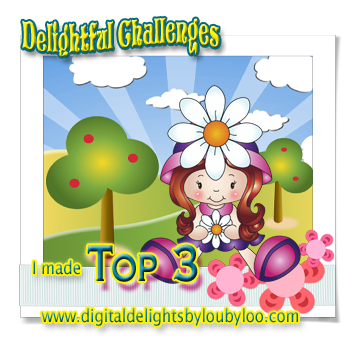 Check out the other inspiration from the Silhouette Challenges DT, then do some welding of your own. Save yourself some time and read the rules first! Thanks for visiting today! It's Friday, it's almost the weekend, and it's time for the party to begin! 3 Girl JAM is 2 years old in September, and it's a month-long party. Here's the hop order, in case you've stumbled across my blog. I wrapped the box up with Sterling ribbon from the 3 Girl JAM Celebrations bundle. The box was cut out from a file I found in the Silhouette Store. You can find it here. 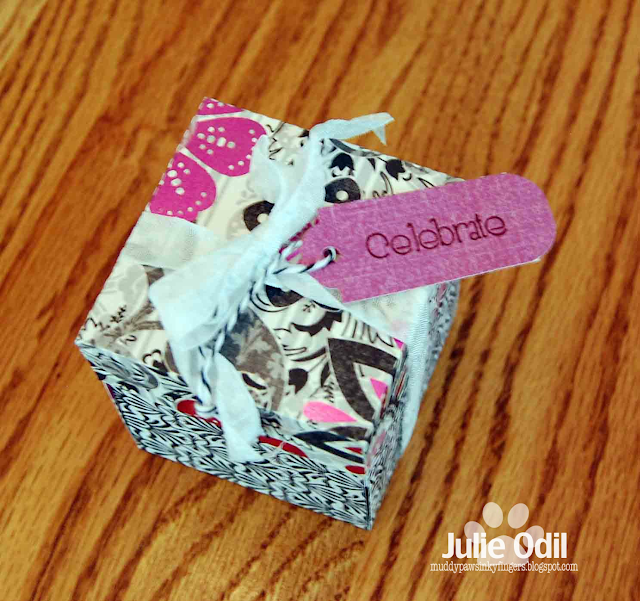 The tag was stamped with a Unity stamp from the Happy Everything set, and tied with a little Trendy Twine. Want to know what's inside the box? Of course you do! It's an exploding box with a three-tied paper cake inside. And of course, it's decorated with a 3 Girl JAM ribbon flower on top. I used the same Sterling ribbon from the Celebrations bundle because this is a P-A-R-T-Y! There's also a vintage button from the 3 Girl JAM store on the very tippy top of that 3 layered cake. Looking yummy, isn't it? The papers are from DCWV -- The Black Currant stack. And what's a party without prizes? I have 2 to give away. 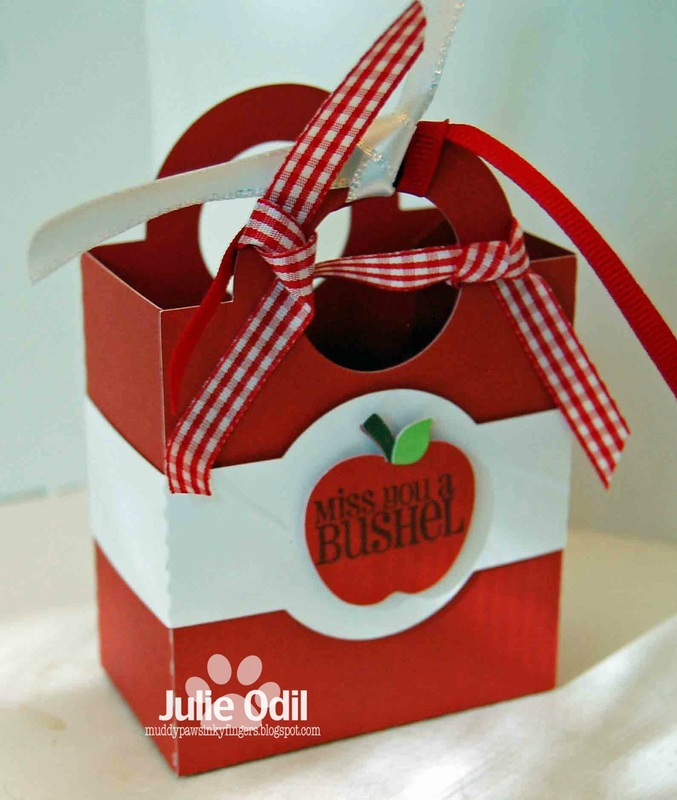 Julie, the owner of 3 Girl JAM has generously given a prize for each of us to give away on our blogs. I have some adorable School Days flair buttons to give away to one lucky, randomly chosen winner. Please leave a way to contact you in your comment. And, if you follow my blog and comment on this post, I also have some blog candy to give away. I have a 6x6 paper pad, some ribbon (of course! ), a stamp set, some bling, some markers and some stickers looking for a good home. I will choose the winner early next week. 3 Girl JAM has some incredible sponsors for our month-long party. You will have opportunities to win all month! Here's a link to all the details on the 3 Girl JAM blog! Now, off you go to the incredibly talented Cheri's blog. Let the celebration continue! There's a cupcake challenge going on (Cakes, Cakes, and Cupcakes) at the Get Inky! 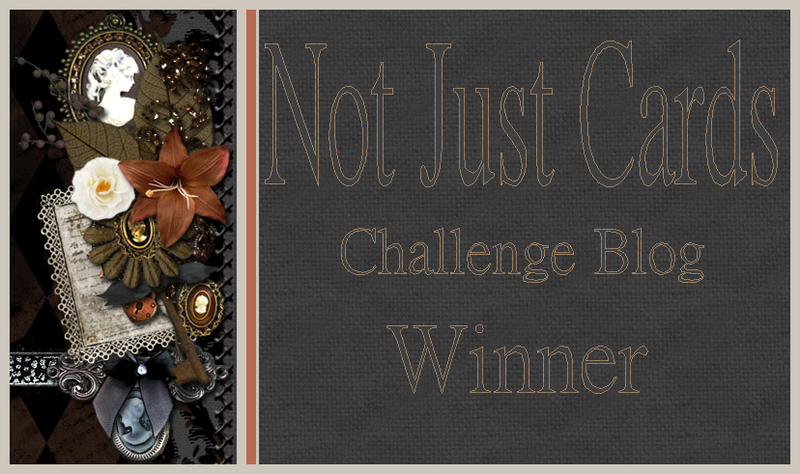 Challenge blog, and Get Inky! Stamps sells some adorable cupcake stamps in their Etsy shop, so this should be a fun, easy one to participate in. Last week, on the Get Inky! Stamps blog, I left a little sneak of what I was making today on the "What'cha Workin' on Wednesday" post. Laura Turcotte guessed it right! 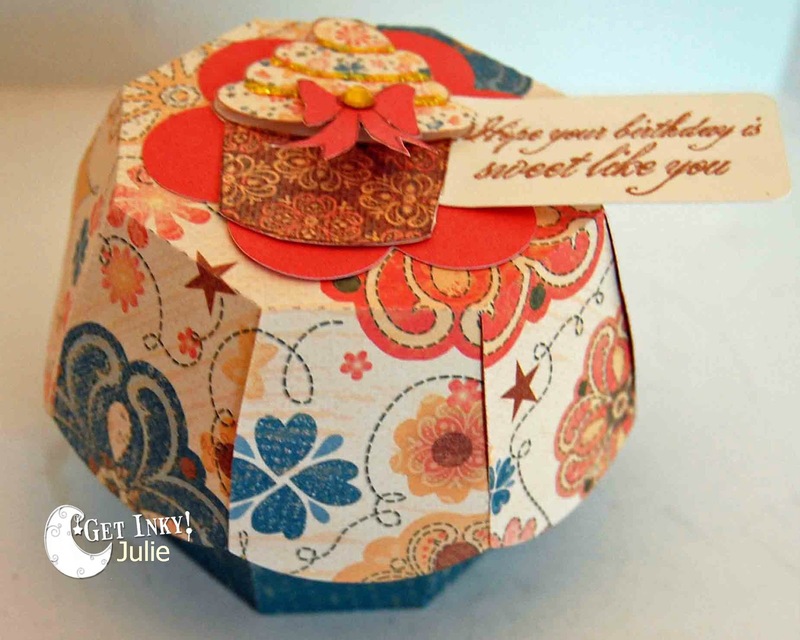 I made a cupcake holder for the challenge, using my Silhouette and some Close to My Heart papers. I stamped a cute cupcake image several times using Close To My Heart Saddle ink, fussy cut it, layered it up, used some Stickles on it to make it look like frosting, stamped and fussy cut a bow, and stamped a sentiment. All the stamped images are from the Get Inky! Sew Sweet Cupcake set. And, there's room inside the box for one delicious cupcake. Here's a close up of the stamped images. Yummy! 3 Girl JAM is 2 years old, and the whole month of September is a celebration. I thought I'd get in party mode with my post today. It's a warm-up for tomorrow's blog hop! Party, party, party! Want to know what's inside the purse? There you go! Your own personal invitation to the month-long party! Come back tomorrow for more celebrating with 3 Girl JAM! There'll be lots of prizes to win and inspiration galore!